George Burr Holcombe was the son of Almon Holcombe. Druggist in St. Louis, MO. Chester, missionary and diplomat to China, was born in Winfield, New York, the son of the Reverend Chester Holcombe, a Presbyterian minister, and Lucy Thompkins. Holcombe's mother, who had intended to be a missionary herself prior to Chester's birth, passed on that intention to her son. Following graduation from Union College in 1861, Holcombe entered the teaching profession. He taught for a number of years at both the high school level and the normal school level in Troy, New York; Hartford and Norwich, Connecticut; and Brooklyn, New York. During the 1860s he also began to study theology and in 1867 was licensed by the Presbytery of Lyons, New York, to begin preaching. In 1868, the same year he was ordained, he began work in Georgia as a missionary for the American Sunday School Union. This first experience as a missionary turned out to be of short duration, for in 1869 Holcombe, accompanied by his wife, Olive Kate Sage, and his brother Gilbert Holcombe, departed for China as a missionary of the American Board of Commissioners for Foreign Missions. Holcombe's arrival in Peking (Beijing) in the spring of 1869 came on the heels of the 1868 Burlingame Treaty between China and the United States, a treaty that led to even greater U.S.
commercial and missionary activity in China. Holcombe quickly understood that effectiveness as a missionary was tied to language skills, and he threw himself into the study of Chinese. While helping to run a missionary school for boys in Peking, Holcombe developed sufficent language abilities to begin producing works in Chinese, including an account of the life of Christ published in 1875. Yet, like other missionaries serving in East Asia during the second half of the nineteenth century--such as Samuel Wells Williams and Edward Thomas Williams in China and Horace N. Allen in Korea--Holcombe found himself being drawn into the world of diplomacy. As early as 1871 he had begun serving as an interpreter for the American legation in Peking. Five years later, when Samuel Wells Williams, who had been something of a mentor to Holcombe, stepped down as secretary of the U.S. legation, Holcombe tendered his resignation with the American Board of Commissioners for Foreign Missions and took over as Williams's replacement. He held the position of secretary of the legation for the next nine years. Holcombe exercised considerable influence at the legation, perhaps partly because of his own language skills but also because of the frequent turnover in personnel. From 1867 to 1882 there were eleven different U.S. ministers or charges d'affaires in China, and Holcombe himself served as charge d'affaires on three separate occasions. Working under Ministers George F. Seward (1876-1880), James B. Angell (1880-1881), and John Russell Young (1882-1885), Holcombe had the opportunity to participate in events that helped to shape the course of late nineteenth-century American-East Asian relations. The 1868 Burlingame Treaty, among other things, had legalized Chinese immigration to the United States. As the influx of Chinese immigrants began to swell in the 1870s, an American backlash, especially within the western states and territories, began to arise. By 1880 the U.S. government was under considerable pressure to limit Chinese immigration to the United States. That same year a three-member commission led by Angell entered into talks with Chinese representatives to adjust the terms of the Burlingame Treaty. Holcombe assisted in producing a compromise draft that became the basis for the 1880 Sino-American Treaty. While this treaty did not completely prohibit Chinese immigration to the United States, it did give the American government the exclusive right to limit the immigration of Chinese laborers and thus set the stage for the harsher and more controversial exclusion acts that were soon to follow. Holcombe, like Angell, was a moderate on the immigration issue and in the 1890s became an outspoken critic of efforts to prohibit all Chinese immigration to the United States. As the controversy over immigration began to strain Sino-American relations, another important issue demanded Holcombe's attention--the opening of Korea. The United States had first attempted to sign a commercial treaty with Korea in 1871, but that expedition had ended in complete failure and considerable loss of life for the Koreans. By 1880 the United States was ready to try again and dispatched Commodore Robert W. Shufeldt to East Asia. Upon receiving the news that China might be willing to offer its good offices on behalf of the Korean government, Shufeldt traveled to Tientsin and entered into negotiations with the powerful Chinese official, Li Hung-chang. Holcombe not only served as a translator for these talks but also played a key role in resolving the most difficult aspect of the treaty--Korea's sovereignty. Li, who hoped to use the treaty as a way of blocking growing Japanese influence in the peninsula, insisted that the treaty include a clause stating that Korea was a dependent state of the Chinese empire. Shufeldt, on the other hand, refused to consider the inclusion of such a clause. The diplomatic deadlock was finally broken when both parties agreed that a separate letter declaring Korea's dependence on China would be written by the king of Korea and sent to the president of the United States. Negotiations were then quickly completed in the spring of 1882, and the treaty was officially signed in Korea on 22 May of that year. Although Holcombe served as Shufeldt's chief assistant during these talks and thus deserves much of the credit for their success, the issue of Korean independence continued to haunt Sino-American relations for the next two decades. With the 1884 election of Grover Cleveland to the presidency of the United States, the Democratic party took control of the Department of State for the first time in twenty-four years. Democrat Charles Denby replaced Republican Young as minister to China, and Holcombe stepped down as secretary of the legation. Holcombe himself had hoped one day to become the U.S. minister to China and, in fact, was selected for the position in 1889, only to have his nomination rejected because of his missionary background by the Chinese government at the suggestion of Li. Olive Kate Sage married Chester Holcombe Jr., son of Chester Holcombe and Lucy Tompkins. Olive Kate Sage died on 28 July 1896 at Hartford, Hartford Co., CT. She was buried on 31 July 1896 at Spring Grove Cemetery, Hartford, Hartford Co., CT.
Mrs. Olive Kate Holcombe, wife of Chester Holcombe, who was secretary of the American legation to China for fifteen years, died Tuesday evening at the home of Henry A. Deming, No. 30 Charter Oak street, after an illness of ten weeks. Her illness began with an attack of pleurisy, which developed into heart disease and finally caused her death. Mrs. Holcombe lived in China fifteen years. He husband is there now and has been notified by cablegram of his wife's death. Mrs. Holcombe's father was the late E. E. Sage. Her aged mother, Mrs. Olive Sage, is now living and has been at East River with her son, E. W. Sage. Mrs. Holcombe was a member of the Broadway Tabernacle in New York. Besides her mother, three sisters and two brothers survive her. They are Mrs. Henry A. Deming, Mrs. Loomis, wife of John W. Loomis of the Aetna Life Insurance Company, Miss Harriet Louise Sage, expCouncilman E. W. Sage and Harry D. Sage. Mrs. Holcombe was a native of East Hartford and was 48 years of age. The funeral will take place at 4 p.m. Friday and burial will be in Spring Grove Cemetery. The Rev. Dr. Charles M. Lamson conducted services at the funeral of Mrs. Olive Kate Holcomb, the wife of Chester Holcomb, at No. 30 Charter Oak street yesterday afternoon. There was a large attendance and there were several beautiful floral pieces. The bearers were Mrs. Holcomb's brothers, Edwin W. Sage and Harry d. Sage; and John W. Loomis and Henry A. Demng, brother-in-law. The internment was in Spring Grove Cemetery. Gilbert Tompkins Holcombe lived at 5246 Twentieth Ave. NE, Seattle, King Co., WA. He was born on 12 May 1845. He was the son of Chester Holcombe and Lucy Tompkins. Served in the Artillery in Civil Was, 1865, fought at Mobile. Samuel Alfred Holcombe was born on 17 January 1847. He was the son of Chester Holcombe and Lucy Tompkins. Cyril R. Holcombe was born on 1 March 1873. He was the son of Gilbert Tompkins Holcombe and Sarah Aurelia Dodge. Lucy Mabel Holcombe was born on 4 September 1873 at Pinckney, MI. She was the daughter of Gilbert Tompkins Holcombe and Sarah Aurelia Dodge. Grace Holcombe was born on 13 August 1875 at Downer's Grove, IL. She was the daughter of Gilbert Tompkins Holcombe and Sarah Aurelia Dodge. [S23] Jesse Seaver, The Holcomb(e) Genealogy, Page 71. Fanny Violet Holcombe was born on 9 January 1877. She was the daughter of Gilbert Tompkins Holcombe and Sarah Aurelia Dodge. Fanny Violet Holcombe lived in 1925 at 615 M. Street, Hoquiam, Washington. Alva James Scott Jr. was the son of A.L. Scott and Fanny Violet Holcombe. Gilbert Tompkins Holcombe Jr. was born on 18 December 1879. He was the son of Gilbert Tompkins Holcombe and Sarah Aurelia Dodge. Gilbert Tompkins Holcombe Jr. lived in 1925 at San Francisco, San Francisco Co., CA. Corabel Aurelia Holcombe was the daughter of Gilbert Tompkins Holcombe and Sarah Aurelia Dodge. Sec'y, Home Missionary Soc., Northwest; Oakland, CA. Chester Alfred Holcombe was born on 19 November 1882. He was the son of Gilbert Tompkins Holcombe and Sarah Aurelia Dodge. Ruth Julia Holcombe was born on 6 November 1884. She was the daughter of Gilbert Tompkins Holcombe and Sarah Aurelia Dodge. Enlisted in 18th Engineers Regiment, 5-5-1917; mobilized at Camp Murray, Washington; sailed overseas, 8-8-17; Reg. routed to Bordeaux where docks and RR tracks were built and the Service of Supply thus built up. Enlisted as pvt; received Commission, 2nd Lieut., 9-5-1918; assigned to machine Truck Unit 310, M.T.C; placed in command 45 days later at death of Commanding Officer, Thomas Brown. As CO of thi sUnit he operated a repair shop for motor vehicles at Lormont, France (in Bordeaux) until sailing for USA 6-27-1919; demobilized at NY and mustered out at Camp Murray, 7-21-1919. Worked in the Playground Dept. for Los Angeles as a Land Agent engaged in purchasing playgrounds and managing the present real estate holdings. Willard Collins Holcombe was born on 22 September 1889 at Hannibal, MO. He was the son of Gilbert Tompkins Holcombe and Sarah Aurelia Dodge. Drafter on airplane work. Helen Lucille Holcombe was born on 5 December 1891 at Kalamazoo, MI. She was the daughter of Gilbert Tompkins Holcombe and Sarah Aurelia Dodge. Marguerite Holcombe was born on 5 December 1891 at Kalamazoo, MI. She was the daughter of Gilbert Tompkins Holcombe and Sarah Aurelia Dodge. Wells Holcombe died at Hartland, CT. He was the son of Moses Holcombe and Hannah Wells. Elihu Holcombe was born on 28 February 1803. He was the son of Moses Holcombe and Hannah Wells. Elihu Holcombe married Miriam Phelps, daughter of Eli Phelps and Miriam Case, on 20 March 1832. 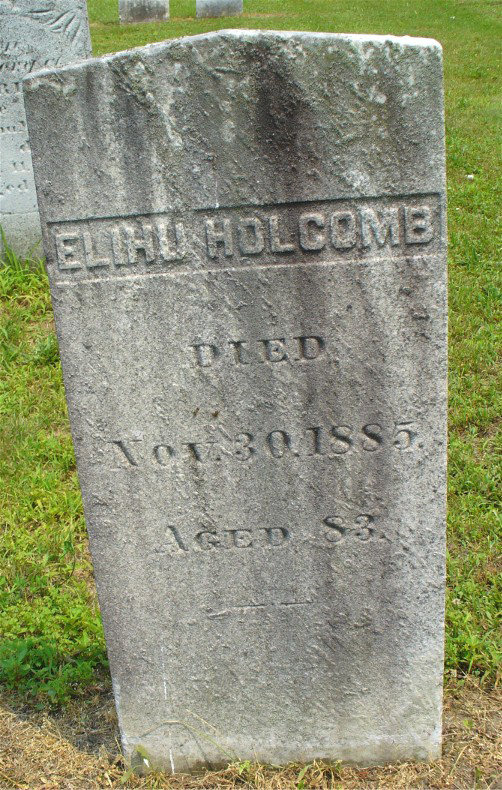 Elihu Holcombe lived at Windsor, Hartford Co., CT. He died on 30 November 1885 at age 82. He was buried at Elm Grove Cemetery, Windsor, Hartford Co., CT.
Wells is recorded in the 1860 Windsor, Hartford Co., CT federal census, page 20. He is a farmer age 57. Children in the household are Sarah age 22, Helen A. 19, Albert E. 16, and Wells 10. There is another minor in the home, Dennis Craon 16. [S25] Hannah McPherson, Holcombe Genealogy, Page 216.2/Item A-8-4-9-3-2-2. Uri was recorded in the 1850 Granby census, as a 46 year old carriage maker, with Sophia age 44, Gilbert age 11, and Lambert age 9. Sophia was enumerated in the 1860 Granby, Hartford Co., CT, census with Dora, age 25, a teacher, Mortimer, age 23, a shoe maker, Asher, age 22, a currier, Gilbert H, age 21, a shoe maker, and Lambert, age 19, a blacksmith apprentice. [S25] Hannah McPherson, Holcombe Genealogy, Page 216.2/Item A-8-4-9-3-2-3. [S161] Carol A. Laun, Granby Center Cemetery, Page 99. Enos Holcombe was the son of Moses Holcombe and Hannah Wells. Enos Holcombe died at Cuba. Elijah Billings Holcombe was the son of Moses Holcombe and Hannah Wells. Caroline Holcombe was the daughter of Moses Holcombe and Hannah Wells. Emeline Holcombe was the daughter of Moses Holcombe and Hannah Wells. Laura Holcombe was the daughter of Moses Holcombe and Hannah Wells. [S735] Donald Lines Jacobus, "Josiah Adkins." [S25] Hannah McPherson, Holcombe Genealogy, Page 102.1. Geneva Holcombe was the daughter of Nathaniel Holcombe VI. Of all the Holcombe's in this record, surely Medad had the most wives and the most children; has anyone called Ginness? Seaver and McPherson disagree on whether Medad's father was Nathaniel V or VI. [S23] Jesse Seaver, The Holcomb(e) Genealogy, Page 74. [S25] Hannah McPherson, Holcombe Genealogy, Page 102.2/Item A-8-1-1-2-1-7. [S25] Hannah McPherson, Holcombe Genealogy, Page 102.2. Myrta (or Myrtle) Fowler was born on 26 June 1798. She married Medad Holcombe, son of Nathaniel Holcombe V and Jemima Atkins, on 10 August 1815. Myrta (or Myrtle) Fowler died on 3 August 1821 at age 23. Nancy Parnel Dudley was born on 29 April 1797. She married Medad Holcombe, son of Nathaniel Holcombe V and Jemima Atkins, on 6 December 1821. Nancy Parnel Dudley died on 26 September 1845 at age 48.